Those of you who follow my photographic exploits, either here on this site or on Facebook, will know that Point Sur, the lump of volcanic rock and its lightstation just off shore of Big Sur, is a favorite subject of mine to shoot. 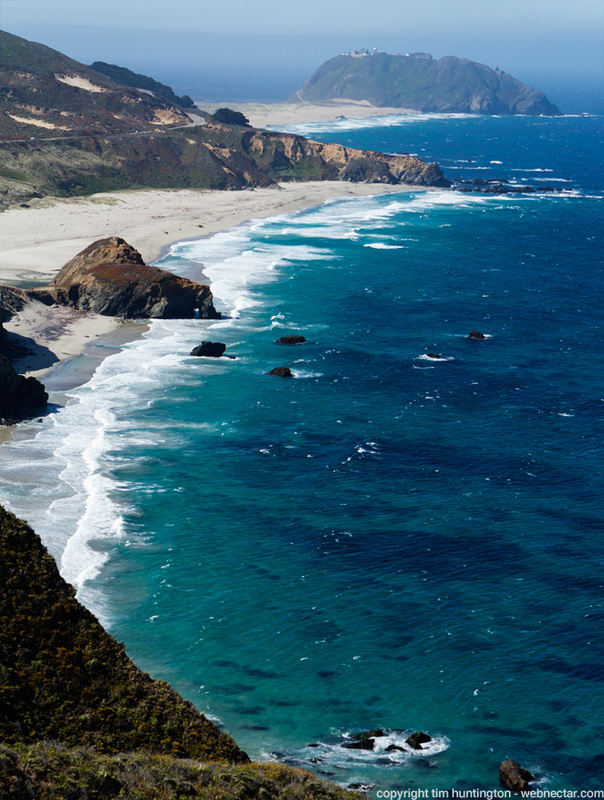 The weather is often dramatic in this area and the place is visible from lots of different locations along Highway 1 as you head down from the Monterey Peninsula to the town of Big Sur. This last Sunday, I once again was taking pictures of Point Sur, though this time I had a very specific agenda in mind when I shot the image below. 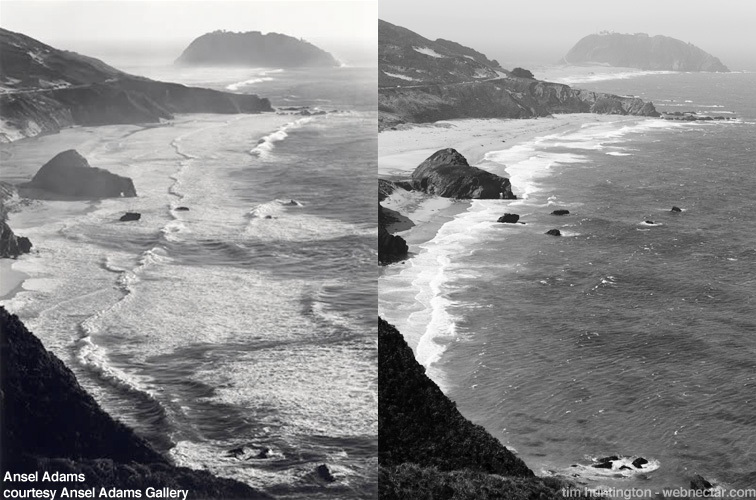 Ansel Adams shot an image of Point Sur back in 1946 entitled Point Sur, Storm. I have an Archival Replica print of it hanging on my wall and as I've enjoyed it, I came to realize that I'd never shot Point Sur from that perspective. Once I realized this, I became curious about two things, firstly, is that perspective accessible today and secondly, how much has changed in the intervening 67 years. Over the last couple of weekends, when heading down to Big Sur to hopefully see condors, I've tried to figure out how far down the hill from Hurricane Point to the Little Sur river this perspective is. Eventually it dawned on me to take a copy of Adams' image with me so I could see if I was in the right place. Luckily, perspectives match at a dirt pullout about 2/3rds of the way down the hill. To see how much has changed, or more accurately, how little has changed in those 67 years, I've put a copy of Adams' image next to a black and white version of my own in the combination image below so that you see for yourself. Obviously, the weather conditions and direction of the sun are different in the two images. They do however appear to be the main differences apart from a small stand of cypress trees that now grace the side of Highway 1 as it rounds the curve and heads off out of sight towards the town of Big Sur. Finally, if you'd like to see this perspective of Point Sur with your own eyes, here's a Google Maps Streetview of the location of the dirt pullout.